1. Office of Civil and Defense Mobilization. NP-10-2 Fallout Shelter Survey: Guide for Architects and Engineers (May 1960); 52 pages, 21 illus. 2. Department of Defense, Office of Civil Defense. TR-68 Mass Thickness Manual for Walls, Floors, and Roofs (June 1971); 48 pages, 34 illus. 1. 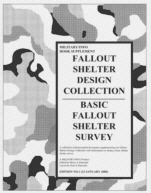 We also have two other book supplements along with this supplement: Shelter Design Supplement and Shelter Living Supplement, as well as the basic book: Fallout Shelter Design Collection. Shelter Design Supplement contains 17 additional shelter designs, Shelter Living Supplement adds information on stocking a shelter, emergency medical instructions, and radiation monitoring basics. Hint: You can use your browser back key to return to this webpage after look at the Research Packet "Details" above.